DETROIT — As always, it was a team effort from the start. One group assembled on Richton Street, another on Monterey. A third tackled the area near the John C. Lodge Service Drive. For three hours on Saturday (July 14), more than 30 volunteers from A Time to Help weeded, weed-whacked, swept, shoveled, raked — and much more — to help beautify the area around Cass Community Social Services’ Tiny Homes neighborhood. It was a robust effort on a hot and humid morning; the group consumed three cases of water by the end of the project. SAY Detroit founder Mitch Albom said he profoundly appreciated the work of the volunteers, especially under the circumstances. SAY Detroit’s ATTH program has participated in volunteer activities at Cass Community for years, including the last two with projects to benefit the nonprofit’s Tiny Homes: In 2016, ATTH helped create the blueprint for the homes by taping measurements on the floor of Cass Community’s warehouse; in 2017, ATTH painted a tiny home and cleared an area of debris to prepare it for construction. On Saturday, ATTH made it three in a row with a landscape project spearheaded by Sue Pethoud, Cass Community’s church and community relations liaison. “Tiny Homes are for poor people, and it’s not just a temporary move, but a chance for economic mobility,”, said Faith Fowler, executive director of Cass Community. Nearly a dozen volunteers who participated Saturday were ATTH first-timers, including Jane and Terry LaFlamme. 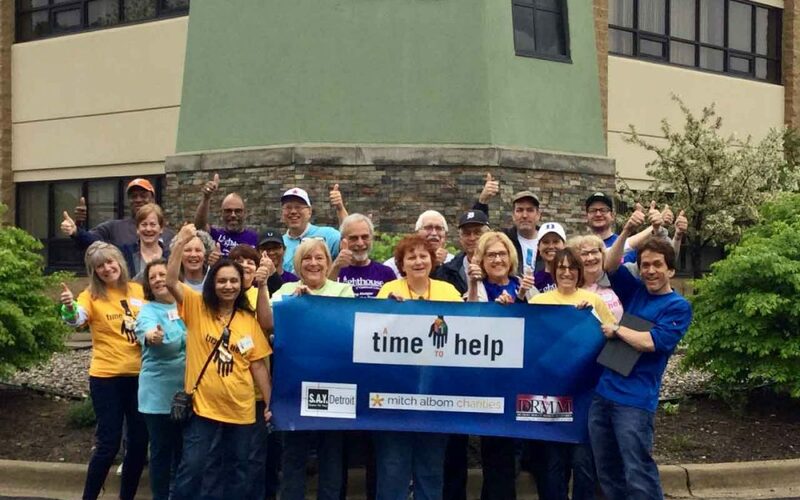 Perhaps the best thing about Saturday’s (June 9) A Time to Help Project at Buckets of Rain was that the weather didn’t live up to the name of the nonprofit we were helping. Sure, there was a sprinkle here and there — enough to postpone the painting portion of the project at Founder Chris Skellenger’s four-acre urban garden on Glendale Avenue in Highland Park, across the street from the S.A.Y. Detroit Family Health Clinic. But Buckets of Rain made sure our 20-member group kept busy. Happily joined by two first-time ATTH volunteers, the team picked and sorted produce, planted seeds, cleaned garden beds, cut the grass, weed-whacked, picked up trash — everything associated with helping the nonprofit in feeding the homeless and needy in the community. Karen Gilbert and John Magnuson of Motor City Paint-Shelby Paint & Decorating even delivered freshly picked vegetables to a shelter after their shift. Once again, S.A.Y. Detroit is grateful to Motor City Paint for donating the paint needed for the shipping container; eventually it will be transformed from bright orange to green. Chuck Schaeffer said the company plans to work with Skellenger next week to get the project completed. Buckets of Rain provides 100,000 servings a season of produce; 95 percent of the donations it receives are used to maintain the Highland Park garden. ATTH’s next volunteer project is scheduled for July 14 at Cass Community Social Services. Details will be announced in the next week or so. Pontiac — Unload, sort, package. Repeat. 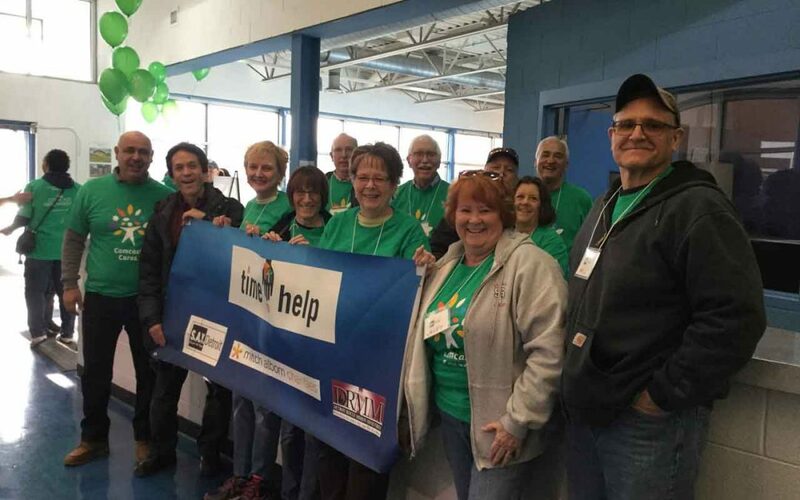 In assembly line fashion, more than 20 A Time To Help volunteers joined S.A.Y. Detroit founder Mitch Albom and radio show co-host Ken Brown on Saturday (May 19) at Lighthouse of Oakland County for one of the largest one-day food drives in the country. For nearly three hours, the volunteers unloaded a semi-truck filled with donated food items and prepared the goods for distribution at Lighthouse, which since 1972 has been serving residents of southeastern Michigan who face economic hardship by providing the support and resources they need to move toward self-sufficiency. 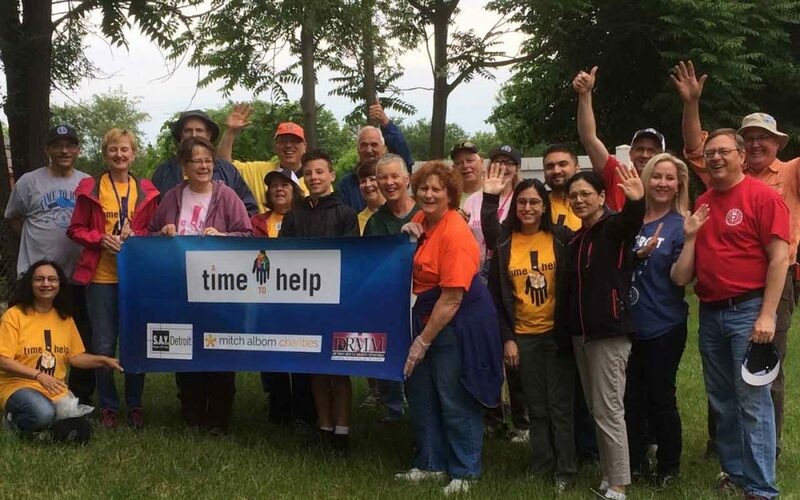 The project was joined by several first-time ATTH volunteers, including Dolores and Bob Harris of Bloomfield Township. James McQueen, pantry manager at Lighthouse, said that the group unloaded and boxed more than 2,000 pounds of food. ATTH’s next project is scheduled for June 9 at Buckets of Rain, a nonprofit urban garden which provides fresh produce for the needy and homeless. More information on the project will be posted when registrations opens later this week at atimetohelp.org. It was double the fun — two volunteer events in one. Nearly 20 volunteers from A Time to Help joined more than 100 others for Comcast Cares Day, a national day of service on Saturday (April 21) at the S.A.Y. Detroit Play Center at Lipke Park. The event drew dignitaries near and far, including David Cohen, Sr. EVP and Chief Diversity Officer of Comcast Corporation, who flew into Detroit that morning from Philadelphia to participate in the project. Partnering with the City of Detroit and Cities of Service, Comcast used the S.A.Y. Play Center as a staging area for a number of beautification and safety projects around the northeast Detroit neighborhood. At a pre-event rally that was attended by Detroit Mayor Mike Duggan, Comcast presented S.A.Y Detroit with a $20,000 donation to go toward continued improvements at the three-year-old Center. Before the ceremony, S.A.Y. Detroit founder Mitch Albom thanked the ATTH crew before the volunteers fanned out to work inside and outside the facility. Their work included sweeping gravel from the parking lot and cleaning walls in the cafeteria and hallway. ATTH’s next project is scheduled for May 19 at Lighthouse of Oakland County. Information and registration will be posted this week. DETROIT, March 26, 2018 — In a span of three hours, the walls of the main hallway of the Detroit Rescue Mission Ministries’ women treatment facility were transformed from stark white to pretty in pink. Actually, the official name of the paint color was “Flowers of May’’ —a soothing pinkish-lavender hue that operations manager Sonya Bailey and the staff at Genesis House III chose to brighten up the building’s interior for its residents. 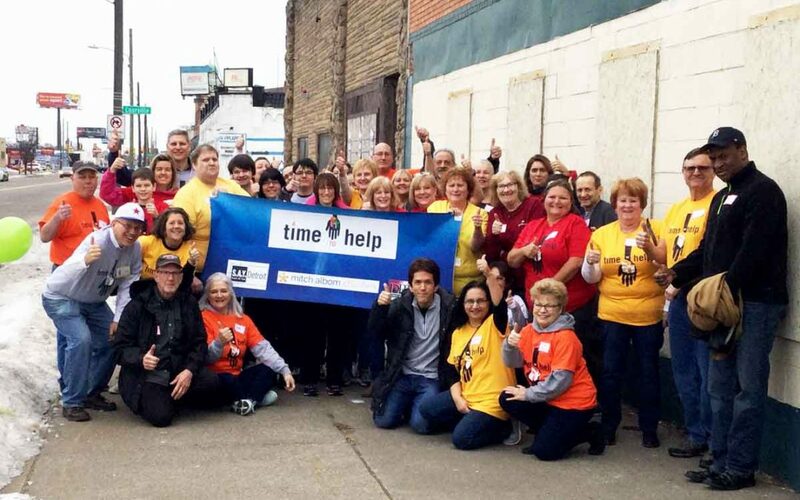 On Saturday (March 24), S.A.Y. Detroit’s all-volunteer team of A Time to Help was more than happy to help make it happen. 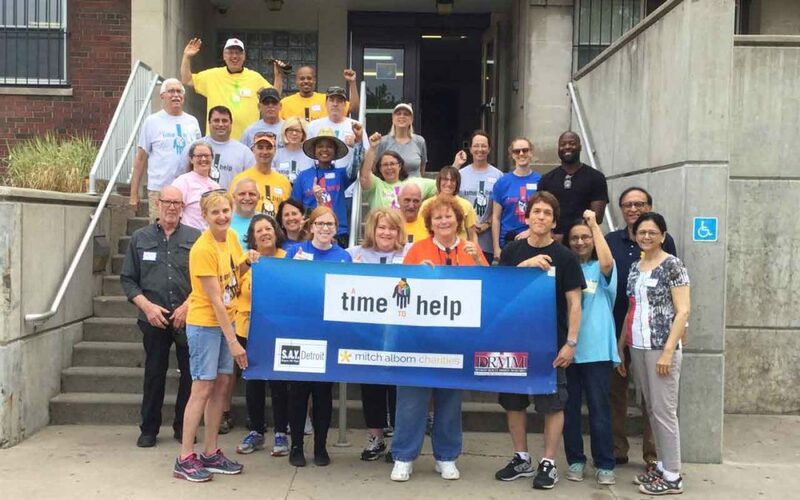 Thanks to Motor City Paint Company, which donated paint, supplies and employees for the event, more than two dozen volunteers were able to tackle the large project — which included painting three foyers — in three hours. Although Albom, founder of A Time to Help and S.A.Y. Detroit, was unable to attend the project, he spoke to the volunteers on speakerphone to rally the troops. Ken Brown, Albom’s radio-show co-host, kicked off the event. The Saturday crew included several first-time ATTH volunteers. 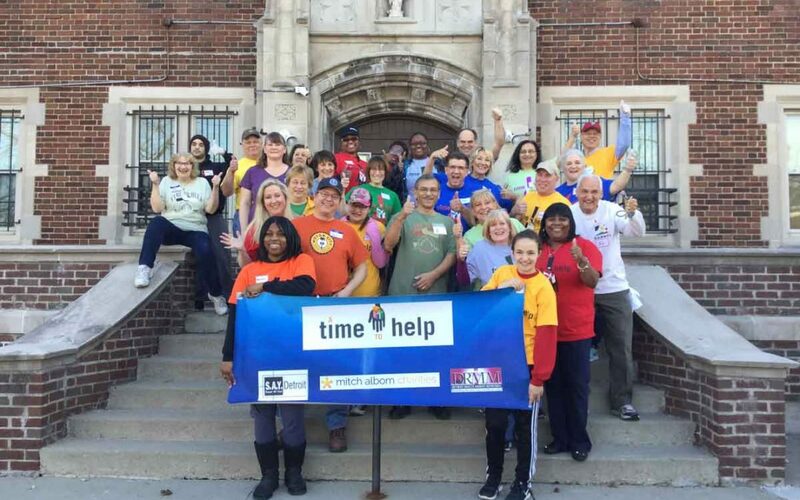 A Time to Help’s next project is scheduled for April 21 at the S.A.Y. Detroit Play Center at Lipke Park. Event details will be posted later this week. Led by S.A.Y. Detroit founder Mitch Albom and his radio show partner, Ken Brown, nearly 40 volunteers from A Time to Help spent Saturday morning (Feb. 17) at the Arts & Scraps Warehouse in Detroit, where the group participated in an “Education Reimagined’’ project. For more than two hours, volunteers cut donated swimsuit fabric into squares for STEM educational kits that will be used in schools across metro Detroit. Arts & Scraps uses recycled materials to help people of all ages and abilities to think, create and learn. The nonprofit serves 275,000 children and recycles 28 tons annually. ATTH’s next project is tentatively scheduled for March 24 at one of the Detroit Rescue Mission Ministries’ homeless shelters, where volunteers will embark on a painting project. Registration for that event will begin the first week of March here.